We are in touch. I receive an ecstatic call from Lauren that, after a few hours of waiting, she was seen by a doctor and, after a few long minutes of poking and prodding and vacuuming and irrigating, the levees have been breached. She can hear. She can hear better than any time in recent memory. Her ears are fixed, good as new. We escape the noisy, suffocating bustle of the city. I didn't like Marseille the first time I visited (no one does) and it's not much better the second time around. We locate a lone bicycle path and chase it east. We pedal up a steep, windy pass and soar down the other end. We reach the beautiful, shiny, seaside hamlet of Cassis, flanked on all sides by towering mountains and cliffs. We stay for three days with Aidas, a lovely Couchsurfing host from Estonia. While he's at work, we go for walks around town and breathtaking hikes through the nearby Calanques, a marvelous network of turquoise inlets and ivory gorges preserved in an expansive national park. We enjoy the use of muscles other than the ones needed to turn a pedal three hundred and sixty degrees on a crank arm. The coast, all delta and swamp before Montepellier, is no longer flat. Our climb out of Cassis is a grueling four-hundred-meter ascent packed into a sharp two kilometers, so we heave our bikes up the hill on foot. From here, it's ups and downs all the way to Italy. Ups, downs, clouds, rain. Rough riding but beautiful scenery. We cycle for days along the Cote d'Azur, the South of France's ritzy riviera. We camp along gorgeous precipices and, on the road to Cannes, cycle through some of the most incredible landscapes of our entire trip. We pass absurdly ostentatious houses clinging to the sides of cliffs. Thirty-eight rooms and an ugly facade, like the architectural love children of Dali and Gaudi. We stay, in one of the more modest coastal towns, with the mother and stepfather of Matthieu, one of our generous hosts back in Miramas. Before leaving he'd mentioned that Carole and Christian lived on the way to Italy and encouraged us to get in touch with them. We do, and they welcome us in with open arms. They are a wonderful couple. Hippies and artists who never quite gave up the lifestyle, even while the rest of their generation traded in flowers and tie-dye for pensions and neckties. Carole is an activist and Christian an accomplished artist (and, incidentally, a phenomenal cook). There's rain in the forecast tomorrow, and Christian is facilitating an artist workshop for some friends. They invite us to join and we spend a long, blissful afternoon painting snowscapes with watercolors under the dim, earthly glow of the couple's skylit roof. We bike with Carole to the bakery and we listen to world music sampled from Christian's massive collection of records. We eat a tremendous amount of delicious food and do our best to express our appreciation in broken French (Carole speaks English but Christian speaks very little). One morning we pack our things, load up our bicycles, and push them out the front door, but then the sky starts drizzling and we're ushered back inside for another thirty-six hours to wait out the rain. We cycle to Nice. We ride along long, uninterrupted bike paths right along the beach and pass a man on a bicycle with an adorable dog sticking out of his backpack. A little while later, that man on a bicycle with an adorable dog sticking out of his backpack catches us up to us, asks us where we're headed, wonders if we have somewhere safe to sleep tonight, and when I say we're just planning to camp once we clear town, he doesn't hesitate to invite us back to his place, right in the center of Nice, for a wonderful evening of pizza, beer, and Winter Olympics on the television. We reach Monaco, latched to the jagged cream cliffs of the French riviera like an overgrown barnacle. Though Monaco is surrounded on three sides by France (the fourth by the Mediterranean), it's its own nation. The second smallest in the world. Second smallest in the world, with the biggest gross domestic product per capita. Monaco doesn't like to be called a tax haven, but that's what it is: a place for the French elite to stash their riches. Monaco is very small (just two square kilometers, or three-quarters of a square mile) and very wealthy ($168,000 GDP per capita). And so while I don't exactly expect to like Monaco, I do expect it to, if nothing else, be pretty. Monaco is not just the richest country in the world, but also the densest. At nineteen thousand people per square kilometer, Monaco is extremely crowded. Very built-up. Constructed in a poorly planned, suffocating sort of way. Buidings tower overhead and winding streets twirl around one another like spaghetti in a bowl and tunnels bore their way into imposing massifs, swallowing cars and drivers into their enveloping darkness. Just cars and drivers, though. Not us. Not us and our bikes. At least half of the roads criss-crossing this tiny nation are closed off to cyclists and pedestrians, which is just fine, but it makes getting through the busting city-state a living nightmare. Hell, we can't even get in. The entrance to Monaco is not through a grand, triumphant archway, nor across an elegant, ornate promenade. The entrance to Monaco, richest nation on Earth, is a dim, mildewed, four-story parking garage expressly forbidding foot-walkers and bicycle-riders from entering. As if to say, if you can't afford a car, we don't really want you in our country. We break the rules and enter Monaco illegally, walking our bikes down the dark, spiraling corkscrew of this garage. We arrive in Monaco, find it wholly unimpressive, stop for a brief picnic near the dockyard (slips running for about $10,000 per day), and do our best to escape this mess of a city without getting run over. It's just three or four kilometers from here to the other end, ordinarily fifteen or twenty minutes of cycling. But escaping from Monaco is a bit like untangling a knotted shoelace: seems small, shouldn't take long, but somehow does, and is an incredibly frustrating experience throughout. At one point, deep in the maze and madness, I stop and ask a police officer for directions to get out of the country. Her eyes widen. She looks at our bicycles and asks, rather increduously, "with the bikes?" I say yes, and she shakes her head in pity, as if to say "oh, you poor, poor thing." We hadn't planned to cross Monaco. But not crossing Monaco required going a little inland, and going a little inland in these parts means going a little uphill. A lot uphill. We crossed Monaco mostly just to avoid a climb, and I can't really say it was worth the detour. Eventually, we emerge. We exit. We reenter France and cycle a dozen kilometers to the Italian border. We flash smiles at the border guards, who just wave us on through, and we cross an arbitrary little line in the sand that demarcates the twelfth country of our trip from the one preceding it. We are in Italy. We'd been looking forward to Italy. We'd been looking forward to leaving behind the Mediterranean, to splitting from the crowded, clustered coast and pedaling into the austere, quiet countryside of Italy's northern plains. We'd look forward to catching sight of the Alps on our left, to curving, peaceful cycle paths and the Po River on our right. We'd looked forward to pizza and quaint Italian plazas and and to the things we didn't even know to look forward to. The pleasant surprises and happy unexpecteds endemic to long-distance bicycle travel. And then, we'd checked the weather. Back before Cannes, actually. Before entering Italy, before Monaco, before the man on the bicycle and the dog in his backpack. We were camped out on the edge of the Mediterranean on a cold night, huddled into our sleeping bags, and I'd wondered how the weather would be next week, on the Italian side of the border. I pulled up the forecast for Ventimiglia and thought no, no, that can't be right. I checked Genoa, a few hundred kilometers to the east. It was the same. I looked up the weather for here, west of Cannes, right where we were camped, where it was cold but still sufferable at the moment. My search radius grew. Okay, cold is coming, but it can't be coming everywhere. How's it looking in Pisa? Rome? Uh, Sicily? The forecast read like this: freezing. Freezing everywhere in Italy and beyond. Highs below zero and lows well below zero (that's Centigrade, mind you, so for our readers from America, Belize, and Palau, highs below thirty and lows around ten). Rain, then snow, and lots of wind. A wind chill of negative twenty (negative four Fahrenheit) in some places. Sustained cold for well over a week. Technically, it's not winter that's coming. It's already winter. It's February, and it's seasonably cold here on the Mediterranean coast. Maybe even a little colder than normal. Certainly colder than last year. What's coming is called a polar vortex. The polar vortex is a globally-scaled cyclone that ordinarily rests atop the north pole, whipping around arctic winds at hundreds of kilometers per hour and making the north pole a very unpleasant place to live. The cold air spins and spins, and the vortex traps the worst of it inside. Every once in a while (in an age of grave and impending anthropogenic climate change, these once-in-a-whiles are becoming much more common), the polar vortex gets a little wonky. Imagine a wooden top spinning on a table, smooth pirouettes one after the other. Now imagine someone knocking into that table, upsetting that top's delicate balance. It wobbles. It wobbles and it veers a little off course. It slows. It falters and it loses energy and it can't seem to get back on track. And so the polar vortex, disrupted from its usual rhythm, is spinning madly across the tabletop of the northern hemisphere. It enters Russia and whips up Siberian snows. It splits in half, one cyclone twirling wildly toward the Pacific Northwest of the Americas. The other end tears across Europe, bringing the Arctic temperatures and the Siberian snow and the sheer force of the north pole with it. It slows and it wobbles and it enters Europe through its eastern end. 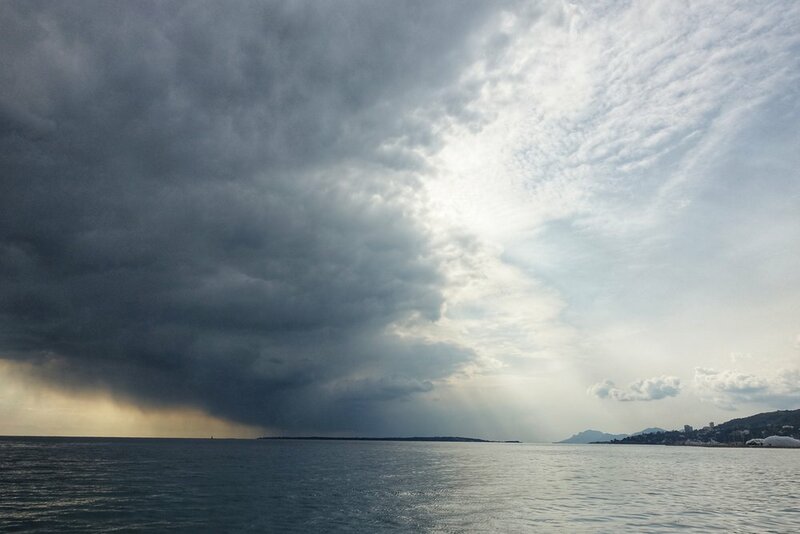 Back on the coast outside of Cannes, we'd learned of its impending arrival. And so we pedaled quickly. Through France. Through Monaco. Back into France. And now we're in Italy. And now the polar vortex is here.